A knee cap injury does not have to put you on the sidelines. Serious athletes still want to move while recovering, and the Donjoy Patella Stabilizer helps protect mild patella damages while allowing more freedom than other braces. Whether you slide into home, glide down mountains or run laps around your neighborhood track, the Donjoy Patella Stabilizer is designed to comfort and project your knee, allowing for recovery and preventing further damage and unnecessary pair. The brace is constructed with tubular buttresses that create a "J" and run parallel to the knee. This reduces the chances of dislocations and injuries for cautious athletes. 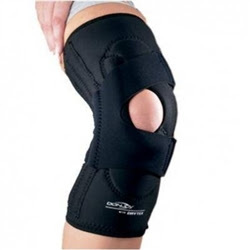 It also keeps the patella in place to avoid accidents or give strength to those trying to heal. The material is made of Lycra with a nylon core and allows airflow without sacrificing support. Braces often cause irritation in hot climates, and some people have special requirements. Donjoy’s knee cap stabilizer is designed for those in warm locations that want a smooth, light feeling. It is also the only solution for athletes who have neoprene allergies. It is intended to prevent or aid in the treatment of dislocated kneecaps, misalignment, Subluxation and Chondromalacia. One knee injury can destroy a career and cause lifetime pain, so proper prevention and care is crucial for athletes. Versatile options mean that you will always receive benefit from your stabilizer. The brace can be worn for daily activities and is comfortable for walking, running or resting. The system will not interfere with movement and can be worn while playing soccer, tennis, basketball or other sports. A strap is provided to adjust the brace to allow a unique fit for every individual. Aluminum hinges give a more secure feel than Velcro or other materials. This allows for more stability when walking and helps restore knee function and provide confidence when moving. Functionality is one of the biggest benefits of the brace. Many knee cap / joint stabilizers are bulky and do not allow athletes to give their best performance. No one should have to choose performance over safety. The airflow technology also ensures players will not become overheated, itchy, or distracted on the field. Comfort is a high priority after safety. Athletes will be able to focus on the game and forget they are wearing the brace. It moves with athletes to give support and a positive feel on and off the court. Downtime is hard on all athletes, but proper healing is crucial for anyone who wants to endure in a given field. The brace reduces time off and aids in recovery. Players can use the Donjoy Patella Stabilizer to adjust to injuries. It is also beneficial when retraining the knee and learning to put weight on it again. About MMAR Medical Group: MMAR Medical Group Inc. is a supplier of orthopedic medical products including a wide selection of Donjoy braces and supports. For quality knee bracing, please visit www.mmarmedical.com.